I actually really enjoy making lunches for myself, so it’s been nice to get back into a routine. I rely on snacks to give me energy throughout the day such as fruit, yogurt, nuts and granola bars. 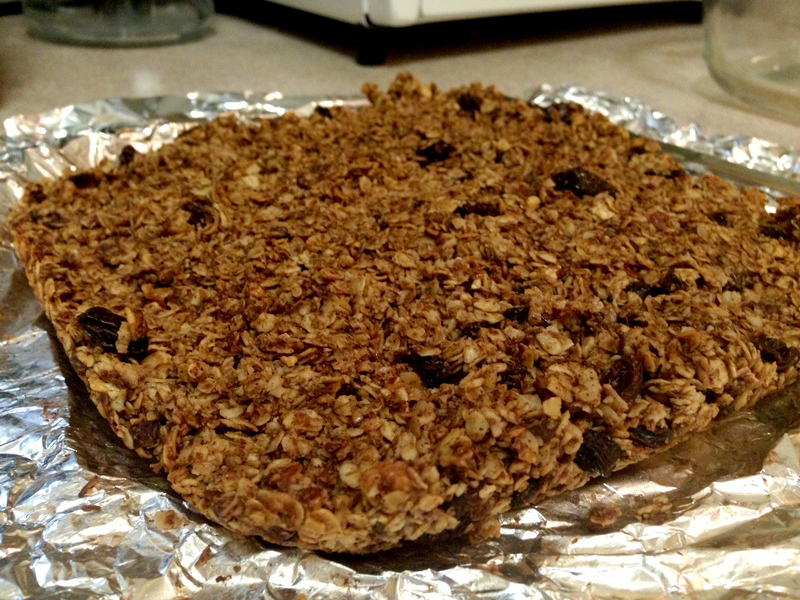 I don’t like spending much money on granola bars, so often times I will make my own. Healthier and better tasting, in my opinion. I made these bars on a whim and used whatever I had in my cabinets. 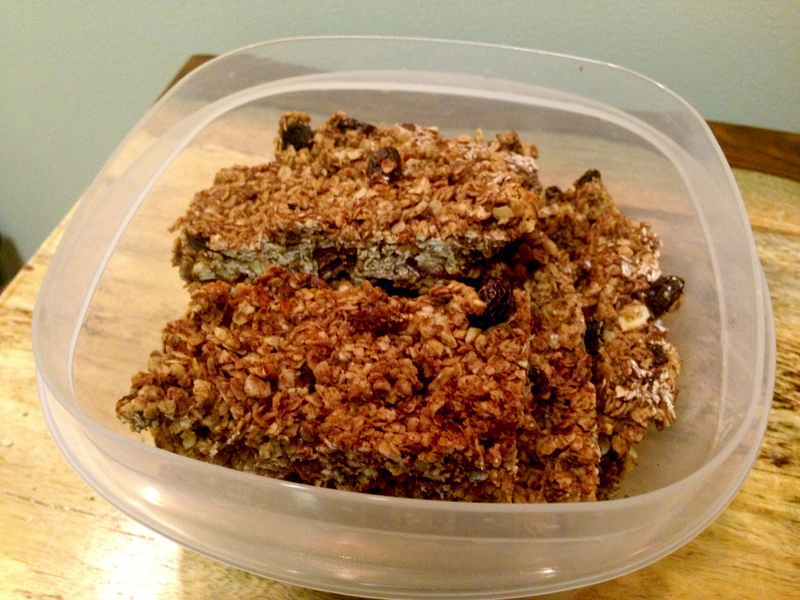 I went with flaxseed, raisins, and chocolate covered almonds that I had on hand from Nature Box. These stole the show. Anything with Dark Chocolate and Almonds is a win in my book. The verdict? Delish! These bars are sweet, but not too sweet and they definitely keep you feeling satisfied. They can get a bit crumbly so make sure to allow them to cool completely before cutting. I even popped mine in the fridge for about an hour. Pack them up for healthy snacks on the go! 1. Preheat oven to 350 degrees. Line 8×8 baking dish with tinfoil. 2. Place raisins in bowl of warm water. Allow to soak for 10 min. 3. Toast oats for 5 min on stovetop. Remove. 4. Toast almonds for 3 minutes on stovetop. 7. Add dry wet ingredients to dry ingredients. Stir until combined. 8. Add almonds, drained raisins and chocolate chips. Stir well. These bars can be stored on the counter or in the fridge for about a week. Enjoy! It’s true, these bars are simply amazing. 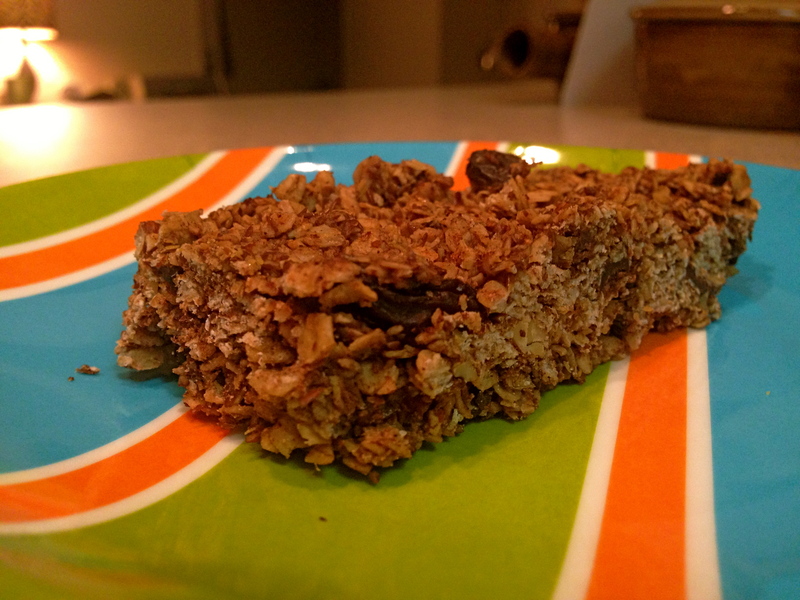 Pingback: Peanut Butter Granola Bars. Quick and easy healthy recipe sweetened with honey.